The contentious, adversarial nature of one meeting gives way to the spirit of cooperation and common ground. What a difference a couple of days make, eh? Last Tuesday the San Diego City Council—save one member—looked like it was fully intent on joining forces with the local hotel lobby to declare an all out war on the newly elected Mayor. The Mayor was backed into a corner while the Council attempted to force him to sign a contract he was vehemently opposed to signing. But this Council was unbowed, determined to show the mayor just exactly who ran this city—they would show him who was in charge. It was a rather embarrassing episode, really. At the conclusion of agenda item S501, it was clear what interests the City Council represented, and it wasn’t those of the voters who elected them. Their strings were being pulled by someone else. At issue was whether Mayor Bob Filner was to be required to sign an agreement with the Tourism Marketing District, or was the Council prepared to force him to sign the agreement, negotiated last November by the City Council and former Mayor Jerry Sanders. The previous week, Judge Timothy Taylor determined that due to the language in the TMD contract, the Mayor could not be compelled to sign any particular agreement, but if the Council were to change the language (by just a couple of words, literally) then he would revisit his ruling. The Mayor had won, and now the City Council and the TMD were about to exact their revenge. Filner was going to sign this contract or else. There were even rumors circulating about a recall election. All because the Mayor wanted extra protections for the city, because he was looking out for the interests of the taxpayers. What an unreasonable guy. It got so bad that the Human Resources Director for the Tourism Authority, in a sign of blatant disrespect for the Mayor, walked up to the microphone during Filner’s allotted speaking time to call him a liar to his face when he brought up the salary of Tourism Authority CEO Joe Terzi. Filner claimed Terzi was making close to $500,000 per year (the actual salary is $435,000 according to tax documents). Althea Salas interrupted, vehemently denying it (she’s the one who is clearly lying). The City Council members, for their part, offered nothing concrete, no details other than broad platitudes in support of the tourism industry, as a reason to support the particular document before them. In their mind the contract could not be improved upon, so there was no reason to even discuss it. Councilman Scott Sherman accused the Mayor of grandstanding for the cameras, wanting nothing more than to put on a show, and that the whole exercise was folly. Filner implored them to hold off for two more days, as he had been in negotiations with TMD representatives and felt they were this close to an agreement. But the Council was having none of it, and a chastened Mayor vowed to continue the fight. Fast forward two days, and we have a different story. As City Attorney Jan Goldsmith called it, we had a Kumbaya moment. Gone was the nastiness. Gone were the accusations of corruption. Instead, as the Mayor had said he would, he continued to negotiate in good faith, and with the help of Councilman David Alvarez, reached an agreement with the TMD. The discussion at the special session was polite, almost celebratory. 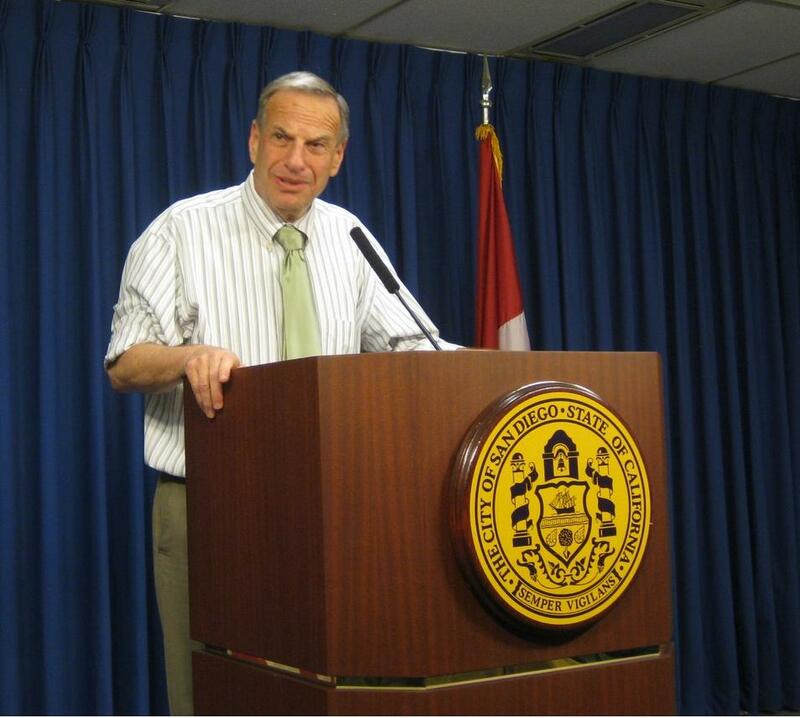 The TMD was going to get their money—as promised all along by Filner should they simply come to the negotiating table. In the end, the Mayor got almost everything he had asked for from the very beginning. The TMD agreed that they would be required to obtain a waiver from 20 of the 25 largest hotels in San Diego that would hold them responsible for their portion of the TMD funds in the event the court rules the TMD funding an illegal tax. Any hotel that refused would have their portion of the funds withheld in trust. The TMD also agreed to put up to 10% of TMD funds collected toward the Balboa Park Centennial Celebration, potentially as much as $6 million. Council President Todd Gloria even agreed—on the record—to explore in earnest an expanded living wage ordinance for San Diego. The evil, grandstanding Mayor, it turns out, wasn’t so evil after all. He was true to his word that he would agree to sign a contract and release the funds the TMD said it needed to advertise and promote tourism in San Diego, despite his staunch belief that the funding mechanism would be found illegal and despite his serious doubts about how the deal was structured. In fact, it wasn’t the Mayor at all who was grandstanding. That distinction falls on the Tourism Authority that managed to pack the Council Chambers with hordes of its employees for several City Council meetings to “express their support for San Diego’s tourism industry.” The misconception they were pushing was that the Mayor himself was against promoting tourism in San Diego. They said he could not be trusted to protect the economic interests of the city. Turns out precisely the opposite was true. For his part, the Mayor is not entirely blameless here. He came at the Council and the TMD like a bull in a china shop, making widespread accusations of corruption and antagonizing the City Council and TMD board. He could have handled the whole ordeal quite differently. His tendency toward combativeness certainly didn’t help his cause. But alas, diplomacy has never been this particular politician’s strong suit. In the end, though, the Mayor wound up taking another giant step forward in his quest to end “business as usual” in San Diego. He stood up for the rights of the taxpayers like no one else in San Diego has in recent memory. Filner campaigned on a platform of wresting control of the city from the “Downtown special interests,” and to this point he has held true to his word. And he has done so in a manner that simultaneously manages to protect the business and economic interests of the city. Now, isn’t that what a mayor is supposed to do? Wouldn’t it be nice, though, if the spirit of cooperation on display last Thursday was a sign of things to come? All this nastiness is so unnecessary, and counterproductive to the interests of the city. Correction: It has been brought to my attention, and I have verified via the web video, that it was Councilman Scott Sherman, and not Mark Kersey, that accused the Mayor of conducting “political theater” and grandstanding for the cameras on the TMD issue. The post has been corrected, and I regret the error. I think it was Councilwoman Sherri Lightner who call it a “kumbaya” moment. At least that’s what it says in Roger Showley’s March 28 report in the UT: . I can’t imagine that coming from Mr. Goldsmith. Nope…..Goldsmith said it first while Filner was giving his spiel. Goldsmith: “I think we’re having a Kumbaya moment here!” or something to that effect. Lightner I believe repeated the sentiment during her Council comment, but it was Goldsmith that said it first in response to Filner. thanks, Andy. I should have checked the video! Good presentation Andy. It is amazing how quickly things can change. On March 27th I sent this email to my Councilmember Falconer. Thanks for this careful summary of the battle for San Diego, Andy. in any oligopoly probably requires his audaciousness. Great article…..that’s for a clear explanation of what’s been going on. Who was the one council member who voted with the Mayor? Marti Emerald. David Alvarez had to leave early due to illness. We have Democrats in Name only on the council. Councilman Sherman accused the Mayor of grandstanding, etc. — not Councilman Kersey.